Eating together is an important ritual, allowing families to spend time together and discuss issues of the day. Some households may also watch television, which limits communication, but gathering together over food is still meaningful. 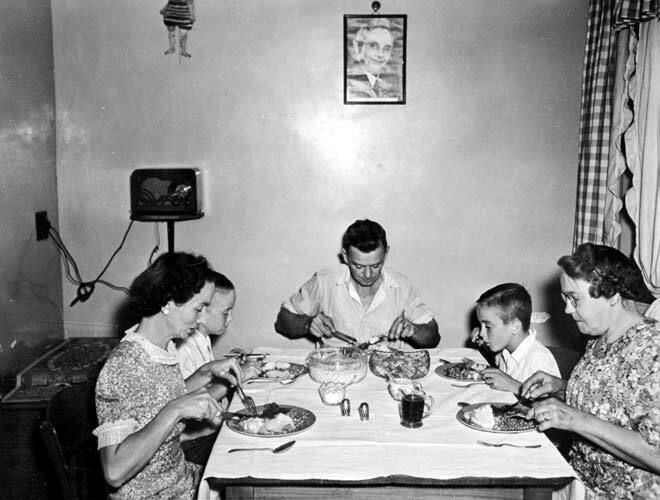 In 1947 the government issued a series of photographs designed to attract British immigrants to New Zealand – including this image of the Evans family dining together in their Palmerston North state house. Father Jack Evans is at the head of the table, flanked by his two sons, Michael and John. His wife, Betty, is at left and his mother, Emma Evans, at right. A photograph of the first Labour prime minister, Michael Joseph Savage, hangs on the wall, a common sight in New Zealand households of this era.